Harvard University is a private university that was established in 1636 in Cambridge, Massachusetts. Overall, Harvard is ranked the #2 university in the United States, according to US News and World Report. The Harvard University Business School is the #1 ranked business school according to US News and World Report. It offers a full and part time, on campus MBA program. If you want to attend a top rated university that will catch the attention of most employers, you cannot do better than Harvard Business School for your MBA. Graduate students in this business school will get a comprehensive, hands-on education with the case method. This teaching technique poses real life business problems that students must solve in teams. The case method is known as a profound educational experience that will present students with the most difficult challenges that companies, nonprofits and government organizations see. These cases are sold throughout the world, and 80% of them are written by HBS faculty, who produce 350 new ones per year. The HBS website states 500 cases are read during the typical two year MBA program. Experiential learning also extends to field study teams where small student groups evaluate current businesses, and immersion trips that involve intense international business study in other nations over winter break. To supplement their business education, Harvard students can attain leadership positions in dozens of business clubs on campus. US News reports the average base salary for MBA graduates from HBS is $137,200 per year, one of the highest in the country. The professional opportunities offered to Harvard MBA graduates are some of the best in the world. Probably only Stanford University offers the same type of professional opportunities and entry level salaries. Even for a highly regarded MBA program such as Harvard, it is still worth noting the program has been accredited by the AACSB. This is the top and most well known business education accreditation agency in the US. Harvard students can be confident that the program meets only the highest quality standards because it has the AACSB seal of approval. 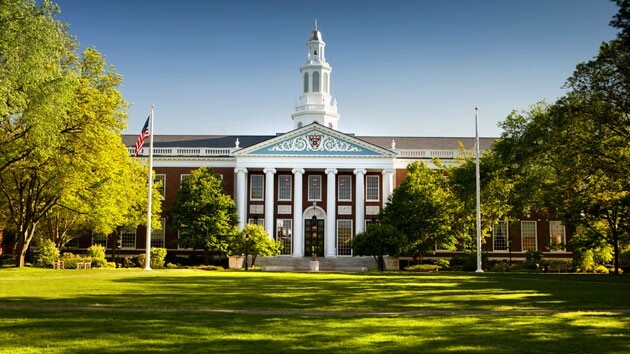 If you make the cut at HBS, you are among some of the most qualified MBA students in the world. Most recently, only 932 students out of 9315 were accepted at HBS, and you will need a GMAT score well over 700. While getting into this program is extremely difficult, if you do get in, you will experience a very high quality program that has only the best students and professors in the world. As one would expect with a top MBA from one of the best schools in the world, it is expensive to get a Harvard MBA. Total MBA cost at Harvard is estimated at $158,000. Annual tuition is approximately $72,000. This is a 13% increase from a few years ago. However, it can cost even more than that. If you live on campus and pay for food, you can easily spend more than $200,000. While these numbers may alarm some, keep in mind that fewer than 50% of students actually pay the full price. The average scholarship award at Harvard is $37,000, and the university paid out $34 million in MBA scholarships last year alone. Also, you can receive up to $30,000 from an outside scholarship before HBS starts to reduce your in house scholarships. Some students are able to get the total sticker price down to $100,000 or slightly less. If you are able to land a business job earning over $100,000 per year to start, this can be a justifiable expense. Many students rave about the quality of the Harvard MBA but others say the program is very high pressure, intense and time intensive. It can lead to some students experiencing very high anxiety and even serious depression. Some students complain they never feel ‘the light at the end of the tunnel’ academically and are constantly overloaded with work. Other students complain the school tries to encourage too many students to enter consulting and finance carers and did not offer enough opportunities for MBA students who want to work elsewhere. But, it must be said that on balance, MBA students praise the program as very well run with very high caliber students and professors. This is a full time or part time, on campus program only. This is not an MBA program for anyone who wants to take classes remotely. 5% acceptance rate overall, making it one of the most selective universities in the country.